Jorge A. Bustamante, Eugene P. and Helen Conley Professor of Sociology at the University of Notre Dame, has been nominated to receive the Nobel Peace Prize byMexico’s Congress. Bustamante, a native ofTijuanawho earned his masters and doctoral degrees from Notre Dame in 1970 and 1975, respectively, has been a member of the Universitys faculty since 1986.He said he was pleased by the nomination and considered it an award in itself, adding thatin the past there have been up to 100 nominations, so I consider this a remote possibility, but the process has begun." 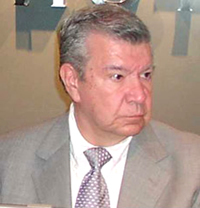 In addition to his teaching and scholarship at Notre Dame, Bustamante founded and served for many years as president of El Colegio de la Frontera Norte, a Mexican research center for the study of social issues affecting the border region between theUnited StatesandMexico. An outspoken advocate of human and labor rights for immigrants worldwide and particularly in Mexico, Bustamante has vehemently criticized proposed legislation which would deny U.S. citizenship to the American-born children of undocumented immigrants, describing it asnot only unconstitutional but a grave act of xenophobia." The selection of a Nobel Peace Prize winner takes nearly a year, and the next award will be presented Dec. 10 inOslo,Norway. Originally published by Michael O. Garvey at news.nd.edu on January 23, 2006.